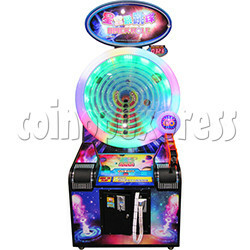 Black Hole Bouncy Ball Redemption Machine is an exciting skill test ticket redemption machine, pull the plunger and shoot the ball to the center circle point targets to win the jackpot for corresponding tickets. Watch the brilliant light show as the ball circles the play field. The cabinet features a small footprint, allowing it to fit in a range of locations with ease, and also features a swirling central playfield where players can watch the ball in motion and LED lighting to make cabinet a bright and stand-out attraction on any floor. Fun and thrilling for players of all ages, you are always a winner when you play Black Hole!